A mutation in the p53 gene, which maintains normal cell function, can be found in many cancer cases. Gene therapy restores p53 and prevents cancer growth. The p53 gene codes a protein necessary for normal cell function. Many cancers, including mesothelioma, have a mutation in the p53 gene. Gene therapy restores p53 to its normal function and helps stop cancer cell growth. Like other emerging treatments, p53 gene therapy is only available in clinical trials. Gene therapy is an experimental therapy currently being researched for the treatment of lung cancers including mesothelioma. The goal of this therapy is to improve effectiveness and reduce side effects over standard therapies such as surgery, radiation therapy, and chemotherapy. This experimental therapy involves introducing normal-functioning genes into tumor cells to counteract carcinogenic mutations. To date, a number of clinical trials have shown success. One such gene that researchers have focused on for gene therapy of tumors is the p53 gene. The p53 gene codes a key protein responsible for regulating normal cell function. It’s often “the guardian of the genome” because of the important role it plays in preventing tumor development. Almost every cancer type has a mutation in the p53 gene. This genetic mutation occurs in 10% of hematopoietic malignancies (tumors that affect the blood, bone marrow, lymph, and lymphatic system) and in 96% of high grade ovarian cancer, with its occurrence falling within this range in other cancer types. In human cancers, the p53 gene is the most commonly mutated tumor suppressor gene, known to be associated with poor prognosis in multiple cancer types, making it a good therapeutic target. The p53 protein also plays an important role in cellular response to stress. In the presence of cellular stress, p53 activates cell responses that initiate cell cycle arrest, growth arrest or apoptosis (programmed cell death), all of which are critical in keeping tumor cell growth in check. It’s also an important regulator in preventing tumor metastasis. Techniques have been developed in the field of biotechnology that scientists can use to restore the healthy, normal-functioning p53 gene to cells that have cancerous mutations in the p53 gene. This complex task involves a viral vector which is used to transport the healthy p53 gene to the cells. Through genetic engineering, scientists alter the viral vector’s DNA, which modifies its naturally infectious nature by preventing it from replicating. This “safe version” of virus is then used as a transport device for high concentrations of p53 gene. Scientists directly inject the tumor with these viral vectors. If the gene therapy is successful, the p53 gene will make a functional p53 protein within the tumor cells, which kills the tumor cells or restores the normal p53 function to the cell, which prevents cancer growth. Preclinical studies have targeted a common genetic abnormality in mesothelioma which causes the p53 pathways to be inactivated. Preclinical studies carried out in mesothelioma cells using gene therapy with viral vectors have been successful in restoring p53 pathways that fight against tumors. In clinical studies, researchers have yet to achieve success in using gene therapy with the p53 gene to significantly reduce tumor size. Studies have been done using viral vector to deliver the p53 gene, in the attempt to achieve direct cytotoxic effects (toxic to living cells) to the tumor, but tumor regression has been minimal. Instead, clinical studies have shifted toward “immuno-gene therapy,” which involves delivery of immune-stimulating agents to the intrapleural space to activate the body’s defense mechanisms. The big success has been with introducing these immune-stimulating agents through viral vectors. This process has produced positive clinical outcomes for mesothelioma patients, showing the feasibility of intrapleural insertion of viral vectors. Specifically, Phase 1 clinical trials were carried out for mesothelioma patients in a first in-human trial using gene therapy to introduce interferon genes, which reduced tumor volume and prolonged survival in the patients. While the development of p53 therapy is still in its infancy, gene therapy with viral vectors may have benefits over conventional therapies such as radiation and chemotherapy, in that it does not suppress immune response. Clinical studies have also indicated that there are likely to be fewer toxic side effects associated with gene therapy. 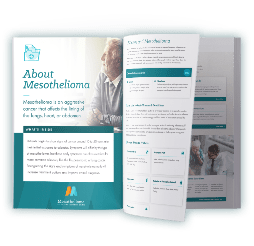 While gene therapy is currently an experimental approach for mesothelioma, the extensive research and clinical trials conducted to date may pave the way for future treatment, possibly in combination with other treatments. Biomarkers will need to be developed in order to determine clinical eligibility. China is farthest along in the clinical trial and approval process for p53 gene therapy. In 2003, p53 gene therapy was approved by the Chinese State Food and Drug Administration for treatment of head and neck cancer. P53 gene therapy has yet to gain FDA approval in the U.S. There has been extensive early stage research and development for p53-oriented therapies. However, only minimal and sporadic efficacy has been shown in trials, with small percentages of tumor cells reversed. However, there have been noted successes for treatment of certain cancer types, including lung cancer. One gene therapy compound that has been successful that is currently in clinical trials is APR-246. APR-246 is able to restore the normal function of mutant p53 in small cell lung cancer cell (SCLC) lines. It has also been used successfully in combination with the chemotherapy drug cisplatin to treat p53 gene mutant non-small cell lung cancer (NSCLC) cell lines. Phase I/II clinical trials have also been successfully completed for APR-246 in the treatment of prostate cancer and hematological malignancies, including patients with a mutation in p53. This trial included 22 patients with hormone-refractory prostate cancer or hematological malignancies. It was found that APR-246 is safe, has a good pharmacokinetic profile, and it induces biological effects in tumor cells that are consistent with reactivation of p53 as the mechanism of action (induction of cell cycle arrest, apoptosis, and alterations in genes that regulate cell growth and cell death). Two patients exhibited positive clinical effects. Successful early phase clinical results have also been achieved utilizing p53 gene therapy through a different mechanism of action, one that induces an immune response in the patient rather than directly activating p53. This gene therapy compound, INGN-225, was shown to be well tolerated and it provided an immune response in small cell lung cancer patients in a Phase I/II clinical trial. Researchers are still recruiting lung cancer patients for p53 gene therapy clinical trials. These studies are essential to learning the true potential of p53 gene therapy and the patients that will respond best to treatment. 1 Tagawa, M., et al., Gene therapy for malignant mesothelioma: current prospects and challenges. 2 Lane, D.P., Cancer. p53, guardian of the genome. 3 Bykov, V.J.N. and K.G. Wiman, Mutant p53 reactivation by small molecules makes its way to the clinic. 4 Deben, C., et al., TP53 and MDM2 genetic alterations in non-small cell lung cancer: Evaluating their prognostic and predictive value. 5 Powell, E., D. Piwnica-Worms, and H. Piwnica-Worms, Contribution of p53 to metastasis. 6 Ma, G., et al., Gene medicine for cancer treatment: Commercially available medicine and accumulated clinical data in China. 7 Tada, Y., et al., A Potential Therapeutic Strategy for Malignant Mesothelioma with Gene Medicine. 8 Cellular & Gene Therapy Products. 9 Walerych, D., K. Lisek, and G. Del Sal, Mutant p53: One, No One, and One Hundred Thousand. 10 Vachani, A., et al., Gene Therapy for Mesothelioma and Lung Cancer. 11 Lehmann, S., et al., Targeting p53 in vivo: a first-in-human study with p53-targeting compound APR-246 in refractory hematologic malignancies and prostate cancer. 12 Zandi, R., et al., PRIMA-1Met/APR-246 induces apoptosis and tumor growth delay in small cell lung cancer expressing mutant p53. 13 Bykov, V.J., et al., PRIMA-1(MET) synergizes with cisplatin to induce tumor cell apoptosis. 14 Alberto Chiappori, H.S., William Janssen, Scott Antonia, Dmitry Gabrilovich. INGN-225: a dendritic cell-based p53 vaccine (Ad.p53-DC) in small cell lung cancer: observed association between immune response and enhanced chemotherapy effect.